The Art of Possibility offers a set of breakthrough practices for creativity in all human enterprises. 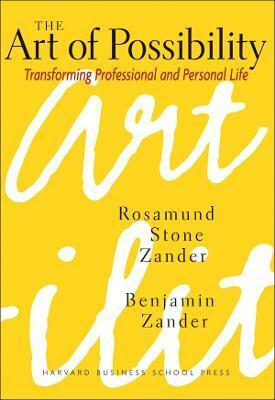 This inspirational book is a synthesis of Rosamund Stone Zander's knowledge of cutting-edge psychology and Benjamin Zander's experiences as the conductor of the Boston Philharmonic Orchestra. Infused with the energy of their dynamic partnership, the book joins together Ben's extraordinary talent as a mover and shaker, teacher, and communicator with Rosamund's genius for creating innovative paradigms for personal and professional fulfillment. In lively counterpoint, the authors provide us with a deep sense of the powerful role that the notion of possibility can play in every aspect of our lives. The Zanders' deceptively simple practices are based on two premises: that life is composed as a story ("it's all invented") and that, with new definitions, much more is possible than people ordinarily think. The book shifts our perspective with uplifting stories, parables, and anecdotes. From "Giving an A" to the mysterious "Rule Number 6" to "Leading from Any Chair"--the account of Ben's stunning realization that the conductor/leader's power is directly linked to how much greatness he is willing to grant to others--each practice offers an opportunity for personal and organizational transformation. Rosamund Stone Zander is a family therapist and a landscape painter. Benjamin Zander is the conductor of the Boston Philharmonic Orchestra and a professor at the New England Conservatory of Music.